The air is cool and crisp. I feel no breeze - only a chilled stillness as the world sits in an eerie silence. In the wake of the morning, my footsteps in the blanket of dead leaves that line my yard are the only sounds to be heard. Even my dog sits, calm yet attentive, at the foot of the stairway to the deck. This quietness is a mark of the thinning of the veil that divides the living and the dead. I can feel the tingle down my spine, the hairs raise on the back of my neck, and my awareness is heightened. Samhain is indeed here. While most celebrate Samhain on its traditional date of October 31st, I tend to feel the veil is at its thinnest at the exact midpoint between the equinox and the solstice. This year, that fell on November 7th at an early 5:18 am. A holiday of remembrance, we utilize our heightened awareness and that thinned veil to honor our ancestors, communicate with the spirit world and connect to our higher selves. We might participate in a silent supper to dine with our loved ones who have passed, leave them food as an offering for their travels, or honor them with altars made of photos and trinkets that once belonged to them. All things magical are strengthened on this holiday, so we turn towards spell work and divination as parts of our rituals. As the first holiday in the darker half of the year, we look towards shadow work, poking around the darkest corners of our inner world to connect with our shadow selves. 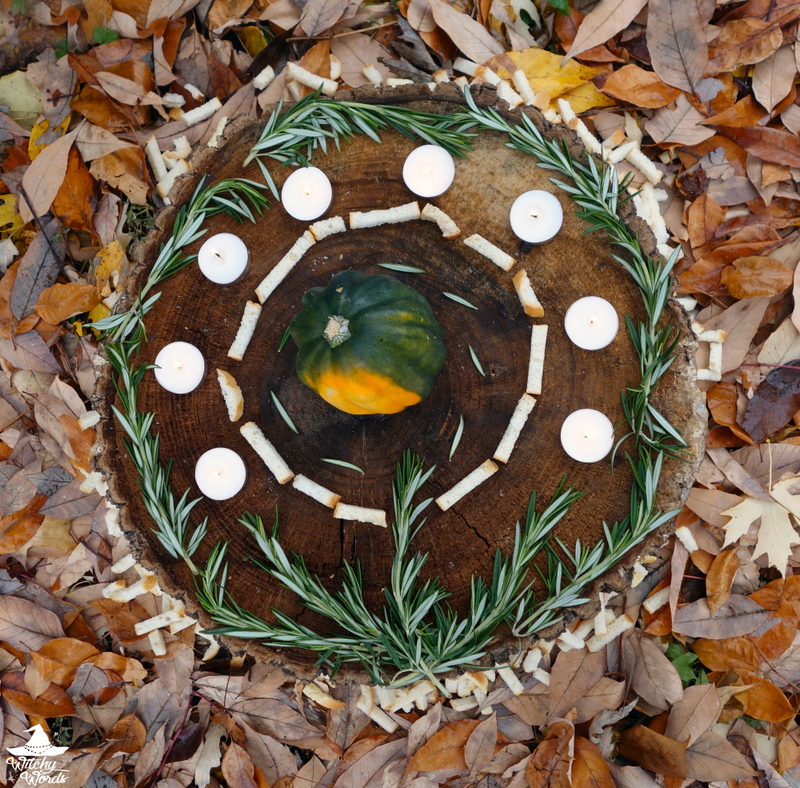 For some, Samhain marks the beginning of the witch's new year, a celebration filled with goal-making and cleansing. Whatever it is that you celebrate, this sabbat is certainly an exciting one! The value of already-owned non-natural items cannot exceed $5 and should be easily accessible. For this altar, the only non-natural items used were the eight white candles that created one of many circles about the altar. Circles are symbols of cycles, be it life or seasons. I wanted to create many circles to represent all these cycles we find within our lives, all the ebbs and flows, the deaths and rebirths that we experience. I used eight candles specifically because that represented the eight sabbats - with this being both the last and the first for many witches who celebrate the Wheel of the Year. Eight is also a balanced number. Balance is essential to managing these many cycles of our lives as well as balancing the living with the dead at this time of the year. I chose white candles because, like the number eight, white is a symbol of balance. It's also a cleansing color that is often associated with the spirit realm and the veil between their world and ours. Inside the circle of candles, I placed a circle of toasted bread pieces. This old bread would have gone to waste had I not toasted it up for use as croutons and stuffing later on. Bread itself is a fertile symbol of life and earth. The repurposing of this bread as it dried out and neared the end of its edibility is yet another symbol of death and rebirth, of balance, and of the cycles we find in our lives. Bread also makes a fantastic offering for the spirits that may visit during this holiday. At the very center of these many circles sat an acorn squash. In November, pumpkins are often far past their prime but sturdy squashes with hardened exteriors - much like that of the acorn squash - are still plentiful. Squashes are a hardy seasonal vegetable often added to our traditional Samhain and Thanksgiving meals. The way that squash grows, connected to one another in a community as they lie upon the ground, absorbing the element of earth, is a testament to how we ourselves live our lives: Connected, protected and grounded. On the altar, I chose to display the acorn squash belly-up, showing off the rich orange color underneath the green. This lively harvest color only comes from the shadows, the darkness, the earth, proof of connection and groundedness making us stronger and brighter in the darkest of times. On the outermost edge of the altar, I placed a ring of rosemary. Rosemary is known as the herb of remembrance and is commonly associated with dying and death. We use the herb for incense, magical seasoning, and spell work during this time of the year. One specific spell often involves tying together three pieces of rosemary with three colors of ribbon: White, black and red. The colors represent life, death, and rebirth - the cycle of life. 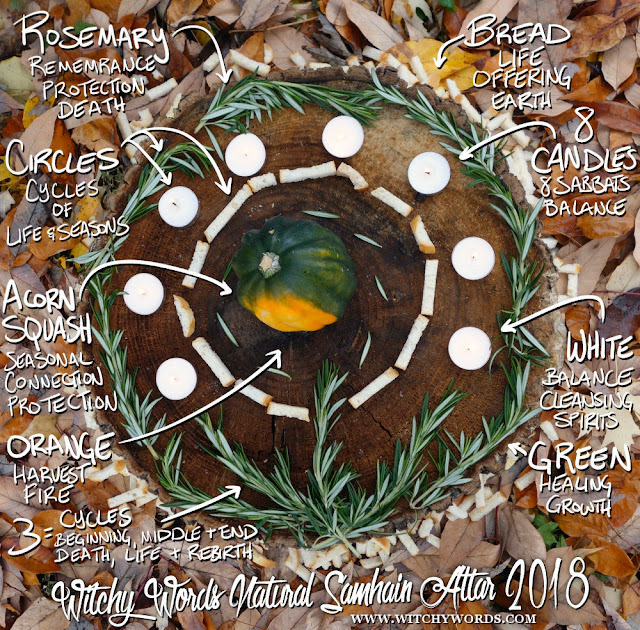 Upon the altar, I placed three sprigs of rosemary sticking upward and into the circles, showing how life, death, and rebirth often interrupt the other cycles of life. They are the common denominator, the experience we will all have, the cycle that we will all experience in the end. Finally, around the base of the stump, I added a large amount of toasted bread as a final offering to the spirits and entities of the holiday. Overall, this altar is about cycles and balance. As we go through our lives, we experience many cycles, big and small. From the smallest cycle of our daily tasks to the yearly seasons, from the beginning, middle, and end of a good book to the ebb and flow of relationships in our lives, there is one common cycle we all will experience: We are born, we live, we die, and we are born again. No matter what other cycles we experience, this is the common denominator, the connecting factor. This holiday is a reminder of those cycles but particularly the one of our own mortality. I'll leave you with a visual explanation of the altar. Enjoy! I hope everyone had a blessed Samhain! Another lovely altar! How convenient that your yard has the tree stump for a natural table top.